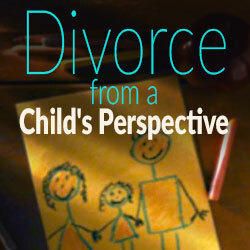 As a child who watched her parents battle for almost 7-8 years, I have an interesting perspective on divorce. I personally never felt sad about my parent’s divorce, they weren’t right for each other, and even at a young age I was keenly aware of that. In my experience, most kids long for the normalcy of their parents being together (keeping their same house, same routine etc.) not their parents actually being a couple again. My personal experience unfortunately took way too long to return to normal, in fact it never did. While things can never be the same, I feel it is easy to achieve a sense of routine my family was simply never able to find. Following separation and divorce it can be challenging, as a child, to continue a relationship with both your parents. There can be a lot of guilt, resentment, and confusion on how to continue a relationship, with both parents. I was often put in the middle between my parents, asked questions about their ex, or showed various court documents to prove a point. Having to answer questions as a child, I felt cornered. I often felt as if I didn’t have a choice, which came with a lot of guilt, as I felt horrible telling “secrets” to my mother about her ex, or vice versa. With retrospect, I so wish my parents would have chosen to tell me the cause for their divorce was simply they weren’t right. As a 12-year-old, it was not important for me to know of all the lying, affairs, secrets, money… the complexity of their battle goes on and on. My advice to children struggling around the country; ignore them. Focus on your normal life, spending time with your friends, keeping your grades up! Make sure to enjoy what you have of your childhood, don’t try to grow up too fast and deal with adult problems. You have a right to vocalize how you feel, and that includes saying you don’t want to talk about it. Divorce can certainly be a challenging time of tremendous change, but trying to keep some normalcy in the dark can help you to move forward. Don’t let your parents treat you like have no voice, you do! While you do still need your parents guidance, and all the way at highschool at that, you still have a right to vocalize your opinions, and also to keep information to yourself. While your parent’s questions can make you feel guilty by remaining silent, throughout their divorce, it helps nobody to say what is happening in your new homes. It creates jealousy, and a need to strike back, which can put you in the crosshairs of a battle. Allow your parents to focus on their own divorce, you focus on being a child and spending time with them the same way that you used to.